Length: 1 hr, 57 min. An American Manned Space Mission Is Captured In Earth's Orbit By A Mysterious Rocket. The Americans Blame The Russians, But England Has Another Theory. 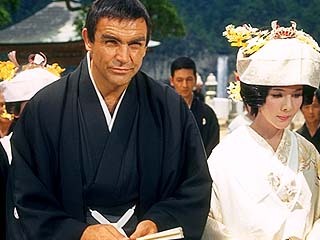 So Bond Is Sent To Japan To Investigate, But Time Is Not On His Side. Another American Mission Is Going Up Soon, And If This Rocket Is Not Stopped This Time, It Will Mean World War Three! Akiko Was Originally Cast In The Part Of Kissy Suzuki, But She Felt That She Fit The Part Of Aki Better. So Akiko And Mie Hama, Switch Roles. But That Was Not The Only Thing That Changed At The Request Of Akiko. She Also Changed The Name Of Her Character From "Suki" To Her Own Nickname, "Aki". During The Filming Of The Scene Where Kissy Swims Back To The Island To Get Reinforcements, Mie Hama Suffered From Stomach Cramps. In Order To Complete Filming On Schedule, A Double Was Used, Diane Cilento, Sean Connery's Then Wife. The Name "Kissy Suzuki" Was Never Actually Used In The Film, But The Name "Kissy" Was In The Credits. 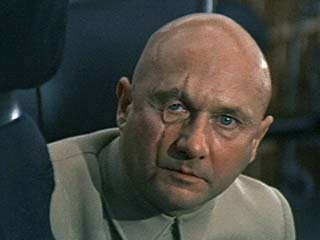 Donald Pleasence, A Famed Character Actor, Was Awarded The Order Of The British Empire By Queen Elizabeth In 1993. He Died While Recovering From Surgery To Replace A Heart Valve. Karin Dor Has Also Appeared In Alfred Hitchcock's "TOPAZ".